I would love some help identifying this bottle. I am not a collector and new to this. This bottle measures approx. 8 1/2 inches tall and 7 inches at widest point. White milky bottle (paint?) and appears to have had black on the front design at one point. Mold seam appears to go all the way up the bottle to rim. I believe this means it dates to 1957? 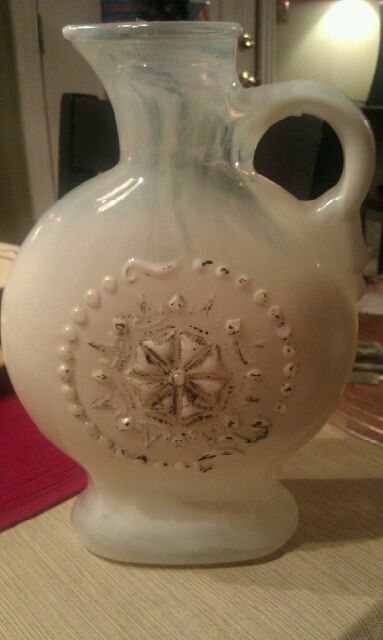 I am assuming it is an Alcohol bottle of some sorts. The bottom markings would not show up. Yes, all bottles containing alcohol in the post-prohibition era up to about 1968 were marked with the FEDERAL LAW FORBIDS embossing. See my web page on this. The 57 may refer to the year of manufacture, which is plausible. The D-334 refers to the Jim Beam Distillery - for quite a period of time in the 50s and 60s, Beam marketed products in fancy containers, some resembling 19th century antique bottles, others (like yours) just purely decorative or whimsical. This decanter contained Royal Opal Bourbon and featured black and gold foil labels. 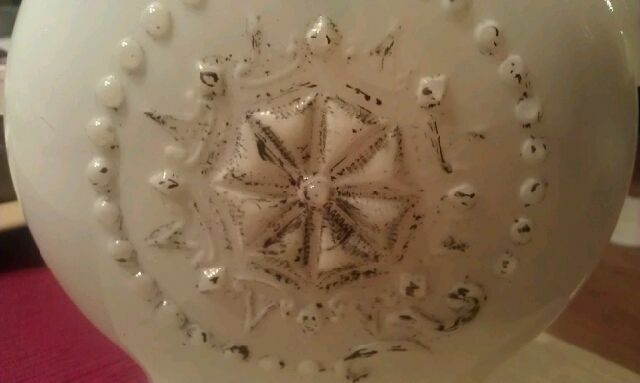 It was originally fitted with a milk glass stopper.